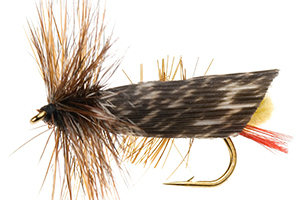 The Joes Hopper has a long and rich history and was originally known as the Michigan Hopper, tied by Art Winnie in the State of Michigan, USA, in the early 1940’s. This large terrestrial dry fly then eventually changed slightly in design, as a fly fisherman by the name of Joe Brooks made it his own, hence the name, Joe’s Hopper. This is one of 3 great Hopper imitations to use in South African waters, the other two being the Ed’s Hopper and the Dave’s Hopper. The Joes Hopper is interesting as it varies from the other Hoppers by not only being a terrestrial, but also being a very decent wet fly pattern. This hopper can be tied with a bit of weight, or one could add a split shot a few centimeters in front of this fly, and it can be fished to imitate a dying or dead grasshopper. The versatility of the Joes Hopper is amazing and many large Trout and Bass have been taken on this pattern in the middle of a hot Summer’s day in South Africa.